(Bloomberg) -- Today in Brexit: Parliament will try to take control and all the Brexit options are in play. This was meant to be the week Britain left the European Union. Instead, all the Brexit options that have ever existed are back in play and it’s now up to Parliament to find a way forward where Theresa May has failed. A soft Brexit, no-deal Brexit, a general election or even a second referendum are all on the table – just as they were two years ago. With the prime minister clinging to her job amid growing calls to resign, members of Parliament will be asked to vote on the various possibilities in the hope of finding a consensus somewhere. But it won’t be that surprising if the whole process of so-called indicative votes is inconclusive and we end the week no further forward. Until now, Parliament has been better at saying what it doesn’t want than what it actually wants. Even now there’s no guarantee that will change. In any case, there's something flawed in the whole idea of these votes. Nearly all the options lawmakers will be asked to vote on are about future ties – for example whether to stay in a customs union with the EU, or a Norway-style arrangement with single-market access. Anything that addresses post-Brexit ties would need to go into the political declaration on the future relationship, the non-binding document that critics say currently sets out a “blind Brexit” as it’s just a vague roadmap to future talks. The divorce deal itself – which includes the “backstop” to the Northern Ireland border – won’t change. That’s the bit that’s causing all the trouble. If Parliament decides it wants Norway, it still has to sign up to the divorce deal, and negotiations on any Norway-style deal won’t be finalized until after the U.K. has left. The bitter row over what Brexit should mean will rumble on. Even if Parliament does at last say what it wants, will May – or her successor – implement it? Anything that has a consensus in Parliament will split the Tory party down the middle, and May has shown repeatedly that protecting the party is at least one of her top priorities. Brexit Secretary Steve Barclay made the point at the weekend that what Parliament decides isn’t binding, and it could contravene what the Tory party was elected to do. Bottom line: No-deal remains an option – just not this Friday. An estimated one million people marched in London calling for a second referendum. The Sunday Times reported a Cabinet plot to oust May and replace her with a caretaker PM. The Sun newspaper called for May to promise to go as soon as her deal is approved. Here’s what you need to know about what comes next in Brexit. Maybe Charles de Gaulle was right. Marc Champion and Gregory Viscusi on why the French aren’t too bothered about the Brits leaving. Brexit is the most ominous symptom yet of a broader crisis of elite credibility and legitimacy, writes Pankaj Mishra for Bloomberg Opinion. Changing the Date | How does the Brexit extension become law? A government minister lays a piece of secondary legislation, known as a statutory instrument, before Parliament. Alex Morales has all the details on how it happens, and when it needs to be completed. No Deal, No Border? | Irish Prime Minister Leo Varadkar signaled he’s confident some special arrangement can be found to keep the border in Ireland invisible even in a no-deal Brexit. “The U.K. government has already indicated that in the event of no deal the first thing they will do is treat Northern Ireland differently in terms of customs,” Varadkar told RTE Radio on Sunday. The U.K.’s no-deal plans include different tariff rules for Northern Ireland. Another Brexit Divide | London property prices are falling because of Brexit, but almost every other major urban area in the country is still experiencing a rising market. Data show annual price growth of 2.9 percent for Yorkshire and Humber in January, and increases of 4.4 percent in the East Midlands and 3.4 percent in the northwest. London declined 1.6 percent – the most since 2009. Markets Complacent? | Financial markets appear to “underestimate the risk” of Brexit to the economy, European Central Bank Governing Council member Olli Rehn told Die Welt. On the Markets | The pound edged lower early on Monday to $1.3197. 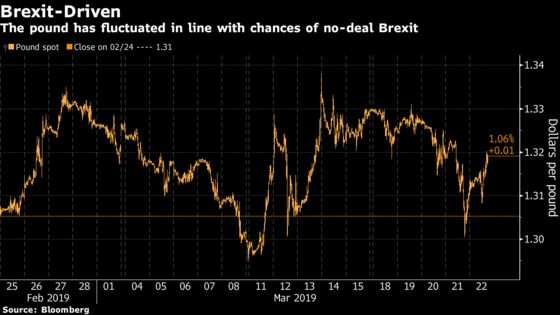 Sterling traders started taking a no-deal exit more seriously last week, with Goldman Sachs revising up the chances to 15 percent from just 5 percent.